Meet the 2020 USA Olympic Rowing Team this Friday at Captain Hiram's Resort. 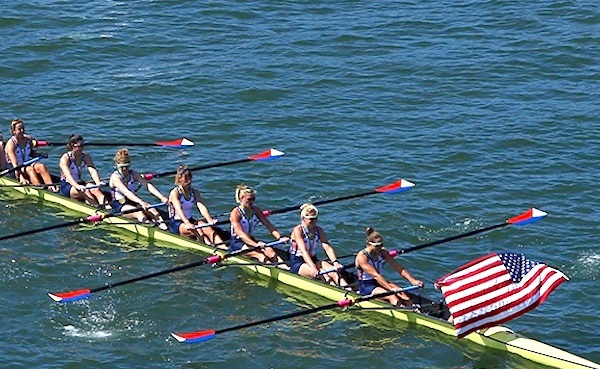 SEBASTIAN – The USA Olympic Women’s Rowing Team will be at Captain Hiram’s Resort in Sebastian this Friday, February 9, at 2:30 p.m.
Hiram’s will be hosting a RED WHITE & BLUE celebration at the Captain Hiram’s Sandbar to cheer them on and wish the whole team good luck in the 2020 Olympics. “As Canal 54 is the perfect training ground for so many rowing teams, we were thrilled to have had them here,” Kimball Stadler, Captain Hiram’s Director of Marketing, told Sebastian Daily. Friday will be a “meet and greet” for the community to go to Hiram’s and celebrate the athletes on the last day of their stay. See you Friday at the Sandbar at the Captain Hiram’s Resort.